momstown Winnipeg is gearing up to launch this summer! We are beyond happy with the overwhelming, positive response we are getting! Moms are excited about a momstown.ca chapter coming here to Winnipeg. While we work hard to set up shop and plan events for you and your kids, we wanted to thank you with a contest! Who doesn't love to win stuff! This is just one of the many contests that you'll see happening here at momstown Winnipeg. This contest is open to all residences of Canada. You don't have to be a member of momstown, but if you live in a city that is then you should be! It's a great way to get out there, meet other mom's, and your kids will have a blast playing with other kids. Do your kids love crafts? 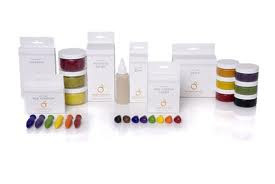 My daughter does, and Clementine Art is a fabulous line of eco-friendly, non-toxic art supplies. My daughter loves to eat anything she shouldn't, like crayons and playdough. So Clementine Art is perfect for young children like her. Want to win this awesome prize pack of Clementine Art? Prize pack includes Clementine Natural Crayons, Glue, Markers, Soy Rocks, Modeling Dough and Paints. Retail value is $75.00 cdn. Sign up for our newsletter (2 points). Visit our website or blog to sign up. Be a fan of momstown Winnipeg on Facebook (1 point). Post this contest on your Facebook page & invite your friends to follow us (1 point). Follow our blog, either with Google Friends Connect or Networked Blogs (1 point). Follow @momstownWpg on Twitter and tweet this contest (1 point). Let us know your twitter handle too so we can follow you back! Then come back here and leave a comment below for each of the ways you're following us. Leave a separate comment for each entry! Be sure to leave your email address so we can get a hold of you if you win! Contest closes midnight, Friday, May 13! Winner will be contacted by email and announced on our blog and facebook fan page! Good luck! *Contest open to all residents living in Canada. Congratulations to Jennifer Hoogerdijk McLatry. You are the lucky winner of our Clementine Art give a way! Thank You to everyone who participated! We will have many more contests in the future so stay tuned! Remember to let us know here which ways you're following us! Signed up for your newsletter. What a great give-away! - Signed up for your newsletter! - Already a FB fan. - Posted on FB and invited ppl to check you out. Signed up for the newsletter via your website! Hey Ester! Following on Facebook and Blog. Also signed up for the newsletter!!!! So excited! oh! and I shared it on my facebook page! I posted this contest on my Facebook page & invited my friends to follow. Awesome Ester! i joined up for the newsletter and of course of one of your biggest fans on MW:) Ill link your contest to my business page and to my home page so you can get more fans! who doesnt love free stuff! I signed up for our newsletter, became a fan of momstown Winnipeg on Facebook, posted this contest on my Facebook page & invited my friends to follow you, follow your blog, and follow @momstownWpg on Twitter and tweeted this contest My twitter handle too is @JulieBlatz. I am getting your e-mail newsletter!